Until Darwin: Science and the Origins of Race: BOOK REVIEW: Political Descent: Malthus, Mutualism, and the Politics of Evolution in Victorian England, by Piers J. Hale. BOOK REVIEW: Political Descent: Malthus, Mutualism, and the Politics of Evolution in Victorian England, by Piers J. Hale. B. Ricardo Brown. 2016. 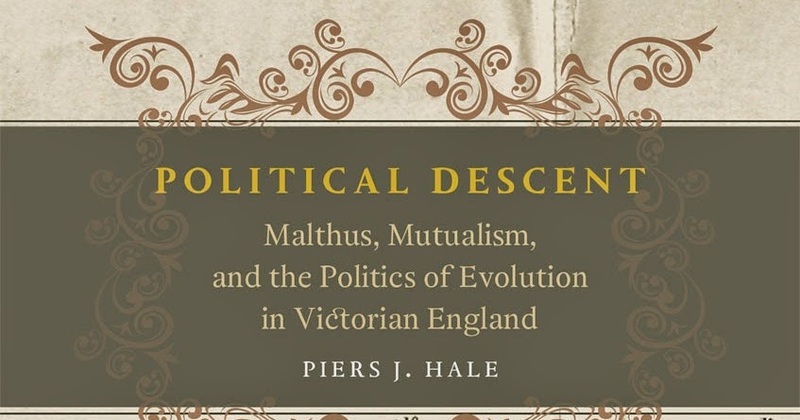 BOOK REVIEW: Political Descent: Malthus, Mutualism, and the Politics of Evolution in Victorian England, by Piers J. Hale. Chicago, University of Chicago Press, 2014. 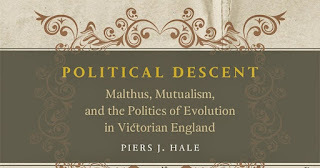 BOOK REVIEW: Political Descent: Malthus, Mutualism, and the Politics of Evolution in Victorian England, by Piers J. Hale. Chicago, University of Chicago Press, 2014. 465 pp. $45.00 US (hard cover). Piers Hale has written an engrossing and well argued work on the complex milieu of Darwin’s early evolutionary theory and its subsequent interpreters. In so doing, he places the current disputes on evolutionary theory, particularly those between proponents of individual versus group selection, into a proper social, historical, and intellectual context. The assumptions regarding the social relations of competition and cooperation were no less obvious in Darwin’s day than in our own. Political Descent argues that Malthus, Lamarck, and especially Darwin himself, were well aware of the political, moral,and social implications of evolutionary theory. Likewise, the assumptions grounding our present debates can be seen in these “distant” debates if we take Hale’s invitation to suspend our usual disdainful sense that the arguments have “progressed” since then, or that it was ever simply an argument between Darwinists and anti-Darwinists. Hale begins with a discussion of Malthus and the politics of evolutionary theory before and after Darwin focused on the role of competition and cooperation in human evolution The question of whether natural selection can account for the existence of altruism and social cohesion produced two ideological formations, one that embraced the social stasis invoked by Malthus, and the other a radical, progressive, anti-Malthusian politics that originates in Lamarck and Darwin’s own Lamarckianism. The opposition is between between those who would interpret Darwin through the lens of Malthus, and those who would have Darwin without Malthus. Hales shifts the figure of Darwin from its usual role as the organizing center of attention to show Darwin in dialogue with Malthus, Spencer, and Wallace. Hale describes how Darwin’s rejection of Lamarck, and with it the radical politics often attached to the theory of acquired characteristics, facilitated the acceptance of the Origin by placing it within the mainstream of Whig politics. However, this invited Malthusian interpretations of natural selection that Darwin flatly rejected. Darwin insisted noted that his use of Malthus was always metaphorical. Darwin’s use of Malthus certainly influenced the reception of the Origin of Species, but Darwin’s Origin reinterprets Malthus theory in support of an ever changing nature. This, Hale shows, contributed to the diverse politics and social theories that continue to spring from Darwin’s engagement with the species question. Hale provides a nice account of Wallace’s often overlooked address to London’s Anthropological Society that attempted to reconcile its avowed polygenism with the monogenism espoused in Darwin and Huxley’s Ethnological Society. Despite Darwin’s enthusiasm for Wallace’s paper, he held firmly to his views on the centrality of natural and sexual selection in human evolution while embracing the portion of Wallace’s paper that showed the importance of social relations in the development of moral sentiment and altruism in humans. Darwin praised Wallace’s paper, perhaps a little back-handedly, as the best he had read in the journal of the Anthropological Society. Darwin’s natural selection faced increasing criticism in the years between the writing of the Origin of Species and the Descent of Man. Wallace’s spiritualism left Darwin without an important ally, and he turned to the work of other liberals during the writing of the Descent. Herbert Spencer, Walter Bagehot, Adam Smith, David Hume, J. S. Mill, Harriett Martineau all appear as influences on Darwin’s monogenic account of how natural and sexual selection could by themselves account for the moral and social evolution of humans. Hale reminds us that the Descent of Man was partly motivated by Darwin’s insistence that “evolution did not endorse the moral standards of every cheating tradesman” nor does “the most noble part of our nature, moral conscience” originate in “the base principle of selfishness” (p. 111). In chapter four, Hale leaves behind these disputes to consider how important English liberals and socialists responded to their rapidly changing social context. Moving from the debate between Spencer and Huxley over the role of government in the progress of society, Hale describes the radical responses to the Social Darwinism, the most well known of these being the geographer and anarcho-communist Peter Kropotkin. Hale reestablishes the place of Kropotkin and radical geography in the history of evolutionary theory. The social and political stakes in the debates between the various interpreters of Malthus and Darwin in the United Kingdom were great. From laissez faire to anarchism, utopian socialism and Fabianism, devotees of Malthus such as H. G. Wells, Henry Hyndman, and G. B Shaw promoted the view that society is itself an organism that evolves. Socialist and non-socialist politics were equally girded by their engagement with Malthusian arguments and Spencerian utopianism. This theme is continued in the discussion of Weissman, Pearson, and others whose thought fit well with notions of degeneracy and decline that were ubiquitous in the late 19th and early 20th centuries. Hale concludes by bringing the discussion back to the present day to remind us that these fundamental disputes have never been resolved, and that they continue to animate our conflicting approaches to the place of human society in evolutionary theory. Hale’s excellent essay shows the social and biological sciences to be deeply intertwined from their moment of origin. Political Descent is a valuable corrective to simplistic accounts of the politics of evolutionary theory. B. Ricardo Brown, Pratt Institute, Brooklyn, N. Y.